2018, which marks the 40th anniversary of Deng Xiaoping's opening-up policy, will see a string of changes which should take China closer to ‘a moderately prosperous society in all respects’. On the side of the NPC, Xi, who also Chairman of the all-powerful Central Ministry Commission (CMC) met the PLA delegation; he told them: “Implementing the strategy of military-civilian integration is a prerequisite for building integrated national strategies and strategic capabilities." Xi encouraged the sisters: “to set down roots in the border area, safeguard the Chinese territory and develop their hometown. Without the peace in the territory, there will be no peaceful lives for the millions of families." A letter from the Emperor was enough for Drolkar to get a seat as a NPC deputy. Drolkar's sudden celebrity has helped her village to grow exponentially; many Tibetans from the nearby villages now want to move their homes to Yume. 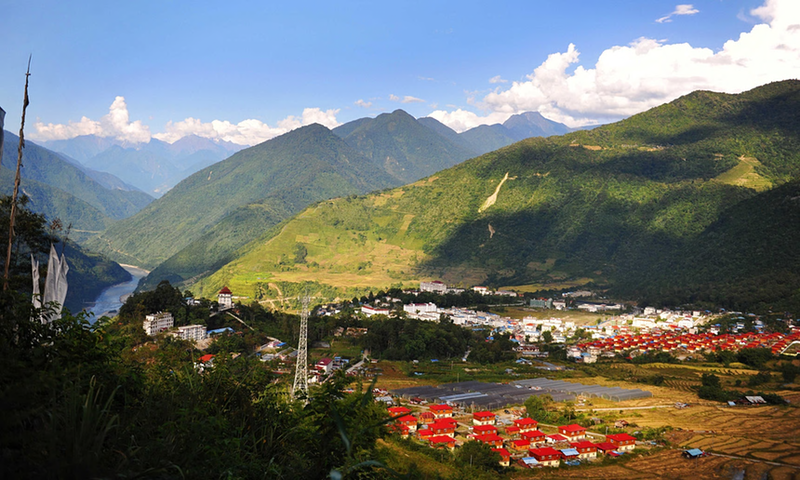 Villagers are building new guest accommodations to receive Han tourists, who have started pouring in. As a result the village will become wealthier ...and the border more stable. That is precisely the Emperor's plan. Kelsang Dekyi told a press conference in Beijing: “Our school building was very poor; teachers and students had to pick grass to cover the roof. The grass was taller than we were, so when we were walking back we'd often trip, and we often had our hands cut. However, if we didn't pick the grass, we couldn't cover the roof, and rainwater would leak into the classroom."